the bobble head doll seemed to be deemed a 20th century relic by the turn of the century, but Major League Baseball again brought back the bobble head doll from pop culture oblivion. The San Francisco Giants presented the Willie Mays bobble head doll on May 9, 1999 to 20,000 visitors to their ballpark celebrating the 40th anniversary of Candlestick Park, which was the last year of the Giants playing at that stadium by the bay. That ushered in a whole new era of bobble head madness. Baseball teams throughout the United States began to offer the bobble head doll as a promotional item for their fans and bobble head dolls were one of the most popular and eagerly sold items in the early days of eBay along with Pez. 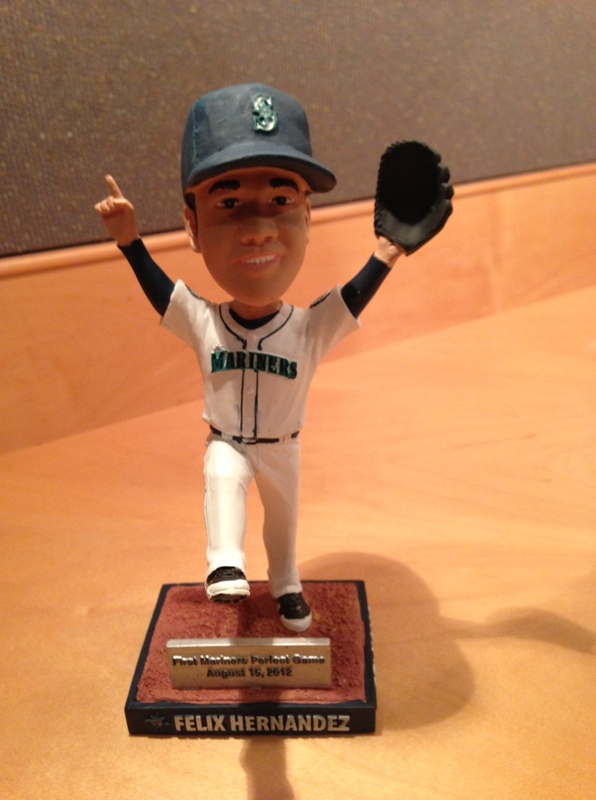 Here in Seattle, the first bobblehead giveaway was at a 2001 baseball game and featured then-rookie breakout star Ichiro. In the years since, I’ve never attended a Mariners gave during a bobblehead giveaway night. Until last night. We weren’t aiming to get a Felix bobblehead. We just wanted to see Felix pitch. When our friend Judy suggested that we join her for a game this weekend, we agreed to choose the game that Felix would start. 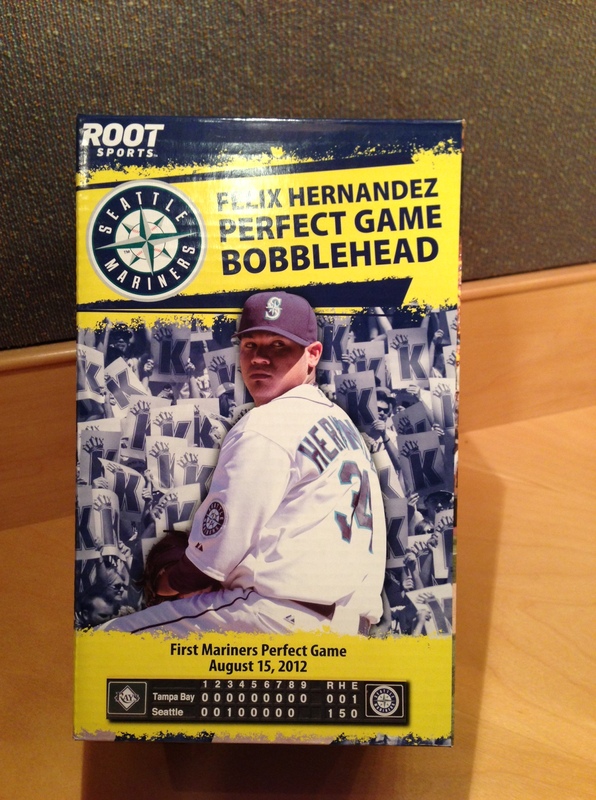 As a bonus, it was Felix Hernandez Perfect Game Bobblehead night. I’ve never seen such a crowd two hours before game time. Well, come to think of it, I don’t know when I’ve ever arrived two hours before game time. We did last night, though not because of the bobblehead promotion. (More on our early arrival and special evening in a separate post.) There were huge lines to get in early, since only the first 20,000 people would get their own Felix. I have no idea why last night was designated as the giveaway night. It boosted attendance, but didn’t relate in any way to when Felix pitched his perfect game, which was last August 15. The box itself is a souvenir. Below is the front side. 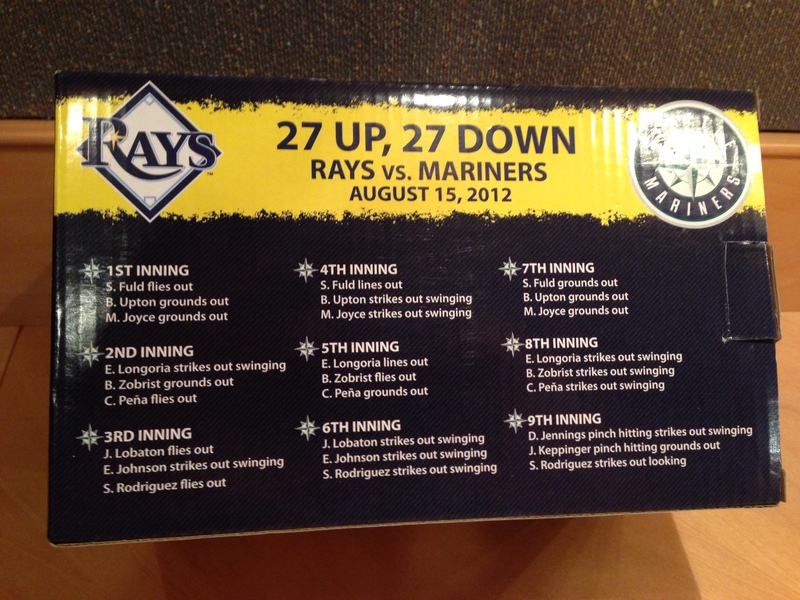 And here’s the back side, listing every batter Felix faced in the perfect game and the result. Perfect games are rare. Years go by without any. Felix’s was the last one, though it was one of three pitched last year. You can see the complete list here. Anyway, this post isn’t about perfect games. It’s about Felix bobblehead dolls, two of which we are now pleased to own. Other proud owners include Gail’s sister Tamara, husband Jim, and son DJ. It was a big night for the family. And perhaps last night also marks the start of a collection. I just checked. There’s one more bobblehead night this year, on August 10. It will be Ken Griffey Jr. “Mariners Hall of Fame” Bobblehead Night, in honor of his induction into the team’s hall of fame. Gail, should we get tickets?